We are deeply saddened to advise of the death of Mr Bryan Cope, President of Dover Rowing Club from 1997 – 2014, who passed away peacefully on 17th June 2016. Funeral service to take place on Thursday 30th June 2016 at Barham Crematorium 10am. Donations, if desired, to The British Heart Foundation or Municipal Charities c/o W J Farrier and Son Ltd, 161 London Road, Dover. 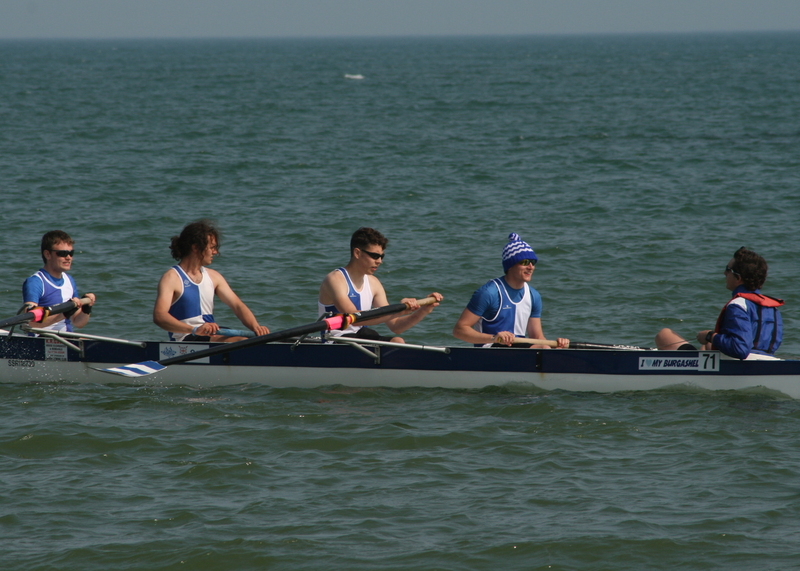 The sixth CARA regatta held at Eastbourne saw Dover RC’s strongest performance for some time. A victorious return for Robin McCorkell from Gonville and Caius College Cambridge saw him secure two victories. McCorkell’s 1st race was the Novice Sculls which also saw Dover’s contingent of Tony Burrows, Cameron Mackintosh and Tom Stothart compete in difficult conditions; two competitors capsized before the start and two others then withdrew. From the outset Burrows took 2nd place which he held through the first 500m with rest of the Dover rowers in the middle of field. Near the buoy turn Stothart capsized leaving the remaining Dover rowers chasing the leader. 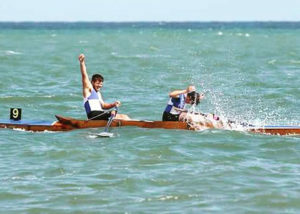 In the last 500m McCorkell laid on the power and closed rapidly on a Herne Bay rower rapidly catching him at the 150m mark where McCorkell on the outside pressurized his opponent into an error. The blades of both rowers touched, leading to the Herne Bay sculler losing control and capsizing, leaving McCorkell to finish a clear 1st. Burrows battled hard to finish 4th with Mackintosh picking up 5th and his first sculling points. 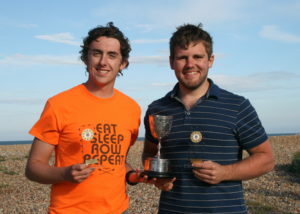 McCorkell’s 2nd win came from the renewal of his partnership with Chris Hall in the Junior Pairs. 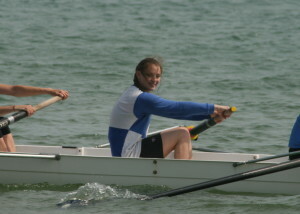 The young rowers got off to a good start in the outside lane seeing them among the early leaders. By the turns Dover’s crew had a slight lead which they extended over the next 500m. Pressure grew from the chasing pack to the last 200m where McCorkell and Hall pushed hard and caught a runner helping to carry them 5 lengths clear for the win. 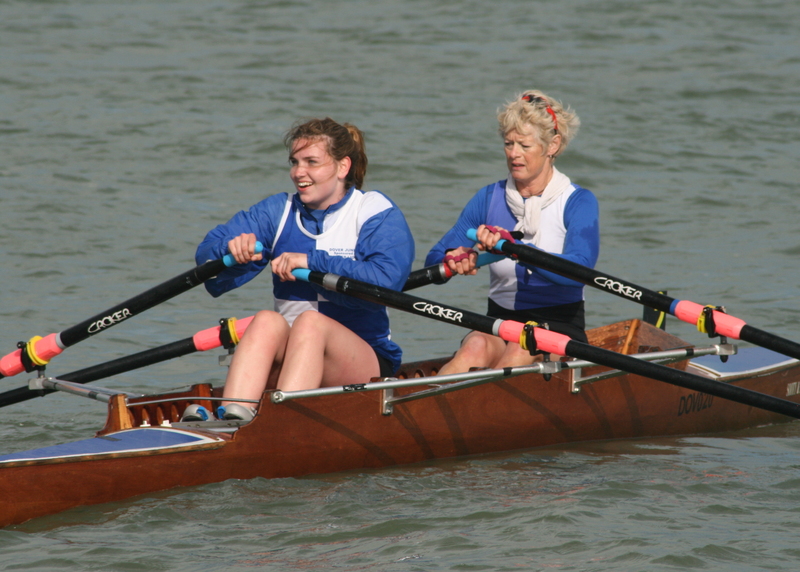 Dover’s other win came in Ladies Double Sculls which saw Dover enter two crews; Jo Johnston / Mary Newcombe and Maria West-Burrows / Megan Barter. Johnston and Newcombe dominated off the line and established a good lead to the turns which they maintained with the chasing crews fighting for 2nd. West-Burrows and Barter came home in 7th. 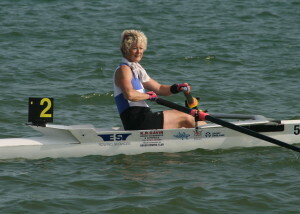 In the other races Johnston dealt well with the conditions in the Ladies Sculls to secure 2nd place in the opening race. Hall’s Senior Sculls saw conditions force some competitors to abandon mid race leaving Hall to finish comfortably in 4th. 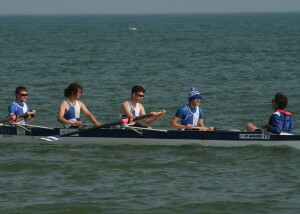 The Men’s Novice Four saw Andrew Bottali, Austin Mills, Stothart, Mackintosh with Newcombe at cox. From the start Worthing jumped out to an early lead with the Dover crew in the pack. The crew fought hard in rough conditions to gain, 2nd place by the turn, a position they held on to for the remainder of the race. 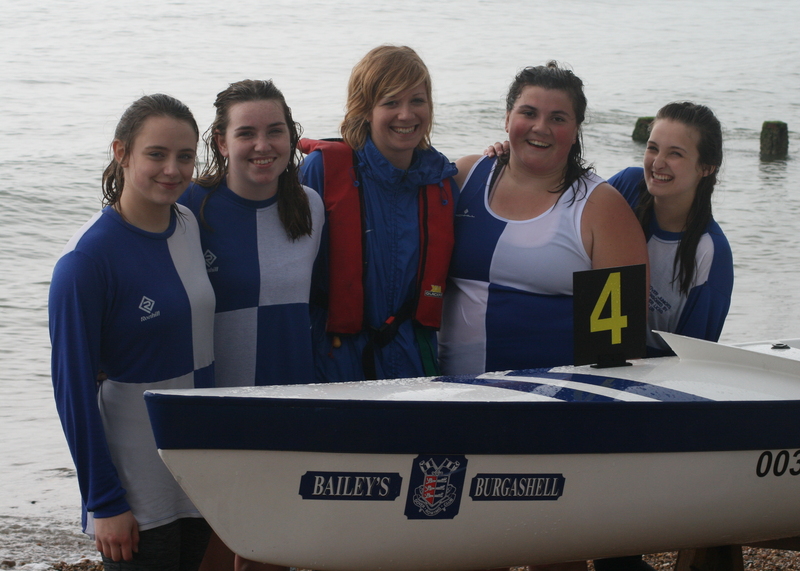 Barter subbed into the Worthing Ladies Novice Four Crew who made hard work of the rough conditions in the outside lane at the start gradually moving up the field to finish in 5th place. The Ladies Senior Pairs race saw Johnston and West-Burrows run dangerously close to the breakwater on the outbound leg before improving their line and bringing themselves into the leading crews. The return leg found the crew battling for 4th place requiring a heavy push to secure the higher finishing position. 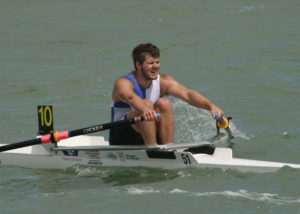 The Men’s Junior Sculls had two competitors for Dover, Hall and Chris Price. Hall and Price were in close order at the turns with Hall in third place and Price in fifth. Hall came under pressure from a late charge and was unable to hold off his opponent falling to 4th place with Price maintaining 5th overall. 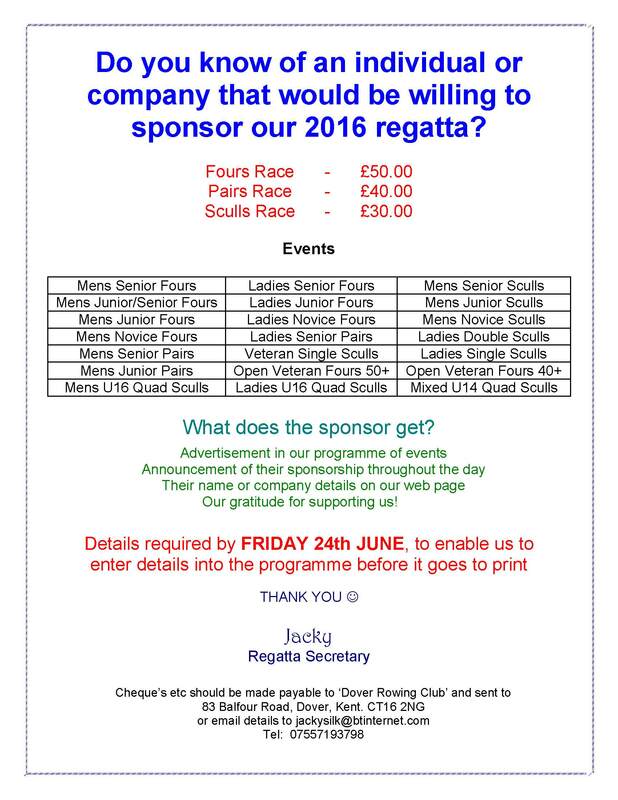 The next Regatta is Dover’s own on the 02/07/2016 at 10:30 in Dover Harbour weather permitting. Barter shines at Shoreham as Dover rowers take five second places. The weekend saw Dover Rowing Club in action in Shoreham and Brighton Regattas. The opening event for both days was the Ladies J16 Quad Sculls with Taylor Warren, Antonia Reed, Megan Barter, Mary Newcombe coxed by Lizzie Foley at Shoreham and Tony Burrows at Brighton. 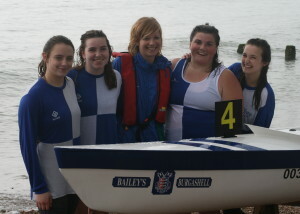 In the 1st race the Astor girls started in heavy rain and were quickly in their flow pursuing Shoreham A down the course. The girl’s crew successfully held off a late charge to secure a brilliant 2nd place. On the 2nd day the young crew could only manage a disappointing 4th. 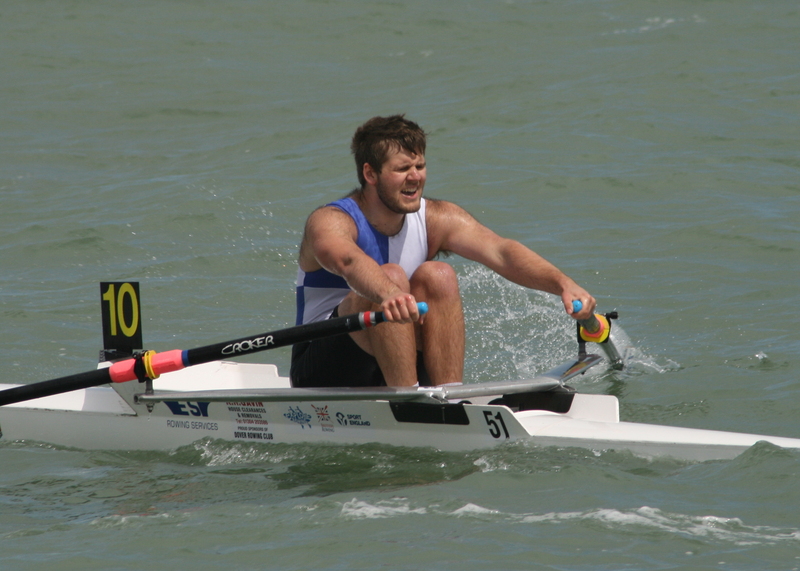 Chris Hall’s performances in the Senior Sculls showed a degree of consistency finishing 5th and 6th on consecutive days in the top sculls event. In the Ladies Senior Pairs Final Maria West-Burrows and Jo Johnston had to fight hard on the 1st day after finding themselves well down the field at the turn. A determined effort saw the pair fight their way through the pack to secure 5th place, the same position they achieved on day two. 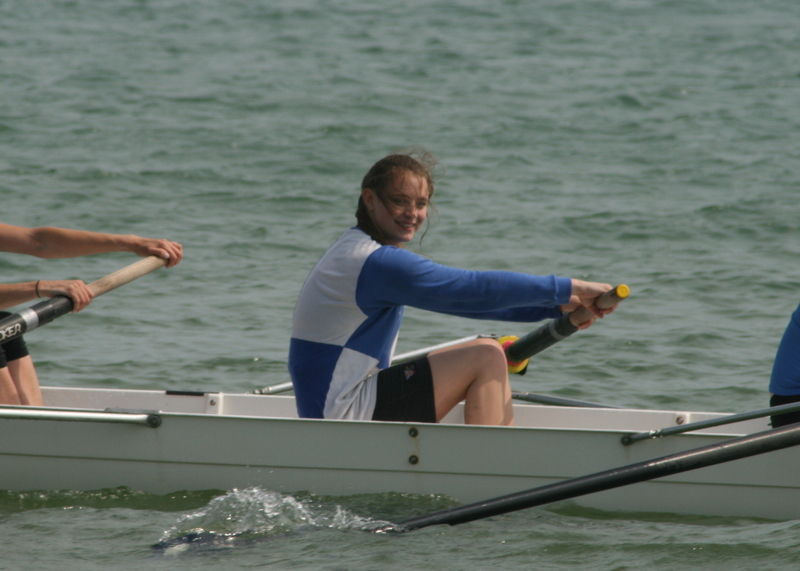 The Junior Sculls race saw Hall and Chris Price in action on day one. Hall turned 3rd and maintained a lead over Price who was battling for 4th with a Herne Bay Sculler who was far out to sea with Price eventually finishing 5th. The 2nd day saw Hall as the lone entry. Congestion at the inside buoys led to him missing his intended turn leaving him down the field. Hall raced hard and fought off a Shoreham rower in a sprint finish to secure 5th. Ladies Junior 4’s of Foley, Amy Lewington, West-Burrows, Petra Matthews Crow coxed by Johnston had difficulty maintaining contact with the lead crews from the start. Establishing themselves in 4th place at the turns, a position they maintained to the finish. The Men’s Novice Sculls saw Dover sculler Burrows, Tom Stothart and Cameron Mackintosh struggling to gain points finishes. Burrows managed the only points with 5th and 8th leaving him the lead novice sculler with Stothart 7th and 11th and Mackintosh 10th and 12th. The Novice Ladies saw the debut of Claire Beaumont, with Lewington, Reed, Newcombe coxed by Foley. Barter subbed into a Herne Bay Crew for the event. Within 200 metres of the start Beaumont caught a crab slowing the boat, her quick recovery given her lack experience was excellent. Dover and Herne Bay turned in the top three and raced hard down the return leg with Barter’s crew pulling ahead only to lose out to the Deal crew on the line with the all Dover crew 3rd. Race day 2 saw Barter’s crew in 3rd and the Dover crew in 4th. Foley received the coxswain of the day award for her performance. Men’s Junior Pairs saw only Stothart and Mackintosh compete on day one finishing 11th. Day Two saw Hall and Austin Mills work hard to secure a point for 6th place in a competitive field whilst Stothart and Mackintosh improved to 10th after the event was re-run. Men’s Novice 4’s saw a great improvement from Andrew Bottali, Mills, Stothart, Mackintosh coxed by Hall on day 1 as the crew were leading at the turn but were eventually overhauled at 1500 metres to finish 2nd securing their first trophies. Day 2 the crew could only finish 4th with the effects of the earlier pairs re-run affecting their performance. 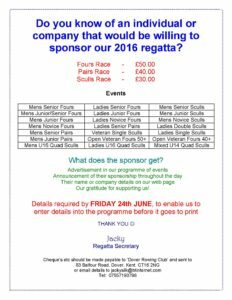 Dover had two crews in the Ladies Double Sculls, Barter, West-Burrows and Johnston, Reed. Both crews showed consistent performances with Johnston, Reed taking 6th and Barter, West-Burrows taking 7th on day one and day two seeing a reverse of the result; Barter, West-Burrows taking the last points place in the more difficult conditions. The last race of both events was the Ladies Single Sculls where Johnston and Foley did battle for Dover. On day one Johnston could not compete with a Worthing rower having to settle for 2nd with Foley 5th. Day 2 saw Johnston take the initial lead only for her nemesis from Worthing to pass her at around 600 metres. Johnston’s pursuit paid off as she nailed her turn whilst her opponent initially missed her buoy leaving Johnston several lengths ahead. With the chase now on Johnston was hopeful of victory and managed to hold off the younger opponent until the last 50 metres finishing 2nd overall, with Foley securing 3rd to finish the day.